Two weeks ago, I took a week off from work for a much needed staycation. No real plans were made, just one to relax and decompress. 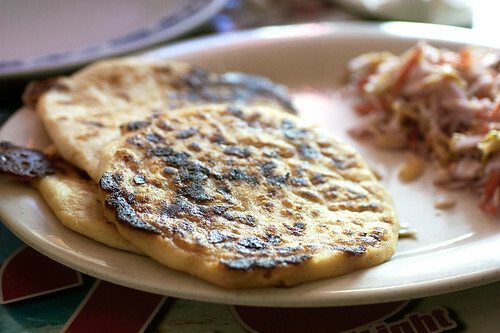 I didn’t do much, but I did eat a lot of pupusas (Salvadoran stuffed corn tortillas traditionally served with curtido, pickled cabbage slaw), which is a good way to pass the time as any. When I say a lot, David and I ate pupusas two days in a row. 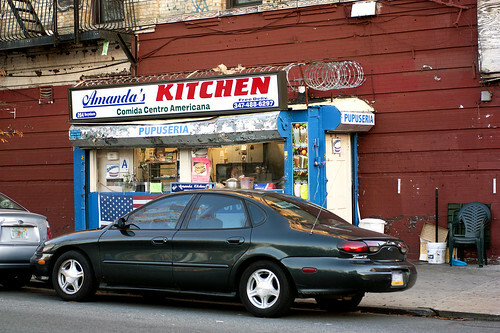 It wasn’t planned, but the first day of “Mission Pupusa, Queens,” there was too much traffic and we ended up at El Salvador in Bushwick instead. At the restaurant, we ordered three pupusas to share: revueltos (fried pork and cheese), queso con loroco (cheese and loroco, a flowering vine native to Central America), and ayote con queso (zucchini and cheese). My favorite was the cheese and loroco. The loroco tasted slightly pickled, and the sharpness was a nice counterpoint to the fried heaviness of the pupusas. After that, the next favorite was the revueltos, and last was the zucchini which tasted bland and greasy. We needed a few more bites of curtido with that one. However, all three would have been much better if there had been more filling. Although at $2 a pop, I guess it’s somewhat understandable. Much better were the aqua frescas ($2). David had a horchata, which had a nice, deep flavor, and I had a marañón (cashew apple), which if you’ve never had it tastes like a cross between pineapple and apple juice with an underlying creaminess. It was a bit cold for it considering the weather, and the seeming lack of heat in the restaurant, but it was refreshing, especially with the fried foods we were eating. After our pupusas, we walked across the street to Amanda’s Lunch, a pupuseria stand we had spied before walking into El Salvador. I ordered one chicharron and one loroco ($2 each). 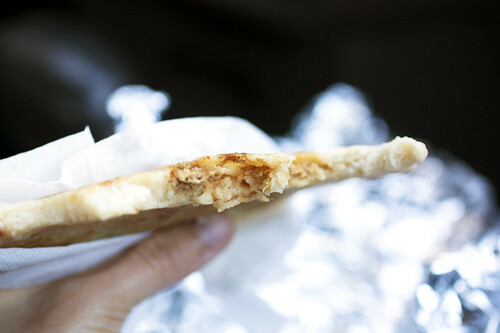 The lady was super sweet, and I really wanted to love her pupusas, but they were thin and barely had any filling. Also, it was especially cold that day, and I don’t believe the hot plate in her little stand was capable of heating up the ready-made pupusas very well. On a positive note, I really liked the little bag of curtido that came with pupusas. It was more fermented than the one at El Salvador and had enough spice to make my nose run. in Jamaica. There, we ordered four pupusas: loroco with cheese, zucchini with cheese, pickled jalapeno with cheese, and chicharron with cheese ($2 each). All four were better than the pupusas we had the previous day. 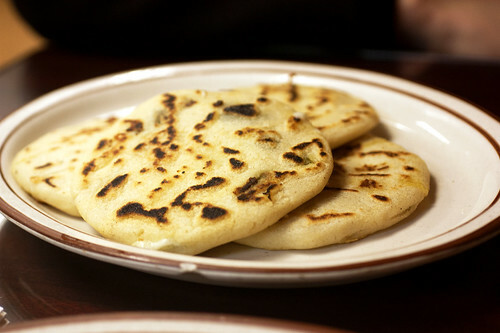 The pupusas weren’t too dense, and all were generously filled with lots of melty, white cheese. Enough so each bite was trailed with strings of chewy cheese. More of the non-cheese fillings would have made them even better, but again, at $2 each, I couldn’t complain. If you’re so inclined, extra filling can be requested for an additional 50 cents, and rice masa instead of corn can be substituted for an extra 60 cents. 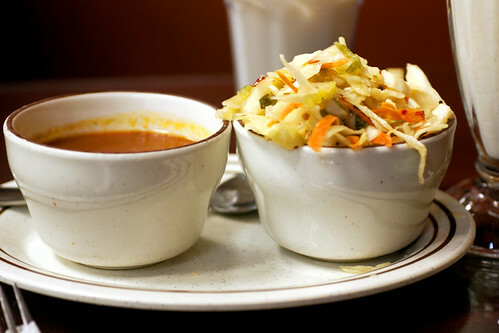 The curtido and salsa roja on the side was also good. The curtido wasn’t as spicy as at Amanda’s, but it still had a good bite. 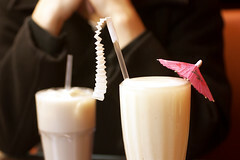 To drink, David had another horchata ($2.70) which was more grainy and less sweet than the one at El Salvador. He preferred El OK’s version, but I slightly preferred El Salvador’s. As for me, I had a guanabana (soursop) shake ($3.75) which was like a tropical pear shake. Again, not appropriate for the weather, but I liked it. I would have liked it even more if it came with a drop or two of rum. So to conclude, if you want the perfect meal of pupusas, grab a horchata at El Salvador, curtido at Amanda’s, and pupusas with extra filling at El OK. If that doesn’t work for you, just go to El OK. No need to make life more complicated than it already is.